During the 1980s, Susan Seddon Boulet pursued her growing interest in the shamanic world, creating evocative works that fused the spirits of people and animals. 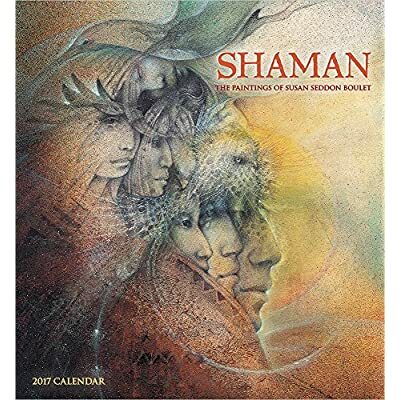 The shaman, the oracle, the wise person, the healerthe one who knowsis in mythical communication with these spirits, controlling and manipulating nature through supernatural powers. Inspired by her readings about shamanism and her personal shamanic journeys, Boulet used her spiritual visions to describe, in exquisite detail, the creatures that inhabit the inner dimensions of the mind. The twelve paintings within this calendar speak to the soul and the imagination. Each is accompanied by an excerpt from a Native American song, chant, poem, or narrative.